A Flat World means our best and brightest students are in a competitive struggle with the best and brightest from around the world. Their wealth creating innovations will quickly spread around a Creative Destructive world. 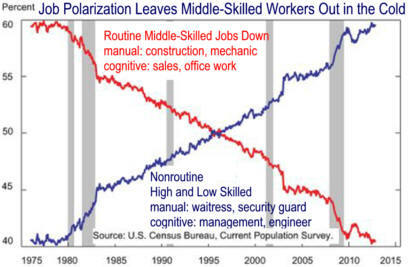 Intelligent computers have replaced many middle skilled workers. This job polarization has decreased the career opportunities for average academic educational High School graduates. Are Stem Jobs the Answer? "Workers with associate's degrees in STEM fields out-earn 63 percent of people who have bachelor's degrees in other fields. Almost half of workers with bachelor's degrees in STEM fields out-earn workers with Ph.D.'s in other fields according to the Georgetown University Center on Education and the Workforce" STEM is the new Liberal Arts where graduates end up in many less academically careers. But America might very well have plenty of STEM specialists already. So many, in fact, that the job prospects for STEM graduates are actually pretty dismal. Perhaps that’s the point. See 1. Do We Really Have a Scientist Shortage? 2.Stem labor shortages Microsoft report distorts! The Ugly Truth There are Few Good Jobs! If you are good at STEM stuff and are willing to study more than the non-STEM majors, you should Go For It because that is where you best job will be. STEM graduates are often are our best and brightest. Many used to major in Liberal Arts and go to work for investment houses on Wall Street, no more. Stem majors do more work, earn higher wages. See The skills gap is phony period, Skills Shortages Manufacturing Overblown and Most New Jobs Don't Require College Education, Do we nee more science majors? Abundant world-wide supply means wages will fall. Bill Gates has been touring the U.S. in early 2013 lobbying for newly minted U.S. foreign college graduates to get visas to stay, work and maybe settle. This increase in supply will push wages down and because all new graduates know new technology and often bring more drive to the job, they will force workers with twenty years of experience to change careers. The useful life of programmers is dropping fast and those devoting time and money to education themselves should be aware of this. "The country’s [Germany] vocational education system—built on a centuries-old guild tradition that combines state-funded classroom sessions with practical training by companies who pay apprentices modest salaries—offers more than half a million high school graduates a year of hands-on education in hundreds of professions as a respected alternative to a university degree. The system has helped keep youth unemployment at 7.9 percent, the lowest rate in Europe." [U.S. with four times the population would need a 2,000,000 student apprenticeship program to compete.] Edited 1/30/13 Germany’s vaunted dual-education system is its latest export hit"
economist.com 6/1/13 ". Germany recently signed memoranda with Greece, Italy, Latvia, Portugal, Slovakia and Spain to help set up vocational-education systems." ....'About two in three young Germans go through this system and into about 350 careers. Some end up in blue-collar jobs, others in sales and marketing, shipping and agriculture, or pharmacology and accounting. The practical nature of the education is an advantage, as is the mutual screening between potential employers and employees during training." The Great Reversal in the Demand for Skill and Cognitive Tasks require a college degree or more, " Many researchers have documented a strong, ongoing increase in the demand for skills in the decades leading up to 2000. In this paper, we document a decline in that demand in the years since 2000, even as the supply of high education workers continues to grow." 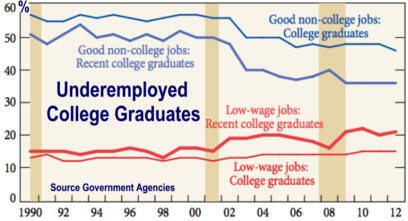 Editor's Note: Data has shown a consistent need of about 25% for bachelors or higher jobs. All the hoping of parents and marketing by educators will not change this. There is evidence that the collateral damage from the education hype may be hurting many, especially young males. My Keene State College 1990 Economics 101 class was given data showing that average college graduates make much more than high school graduates. They had seen it before. That is why most of them were in college. Then I showed them median income of college graduates. They were disappointed with the lower number. I explained how some really high earners make the mean higher than the median. Then I showed them data indicating the bottom quarter of college graduates earned about the same income as high school's top-quarter. They became more unsettled. Then I gave them the lowest income statistic of all, the median income for those with just a bachelor's degree. Those with higher degrees were left off. From the back of the room I heard "you mean they are ripping us off. I pleased to report that the Great Recession has mass media coverage of the decreasing economic return from a college education has substantially increased. But like any unwelcome news, parents, teachers, and politicians will be the last to react properly. The collateral damage has been immense. It will continue to be so unless some responsible mass media helps makes an educational system that improves the well-being of all students . Here is the collateral damage of our love affair with college. College graduates who can't find a job and dropouts owe over 1.3 trillion dollars in outstand college loans and are finding they do not have the skills to earn a positive economic return from their investment. Disgruntle U.S. graduates and dropouts whose needs were not met by their investment of many years in school and from whom society receive little support. In fact, many need society's support. The Tiger Mom social stress has spread to many academically oriented suburban communities. See Reforms to ease students stress divide a new jersey school district The overly academic approach used by most high schools originally had a negative social affected on less advantaged students. Now it is showing up in middle class males.